MG-SOFT Corporation: NETCONF Browser Pro. The future of network management and network configuration is here! 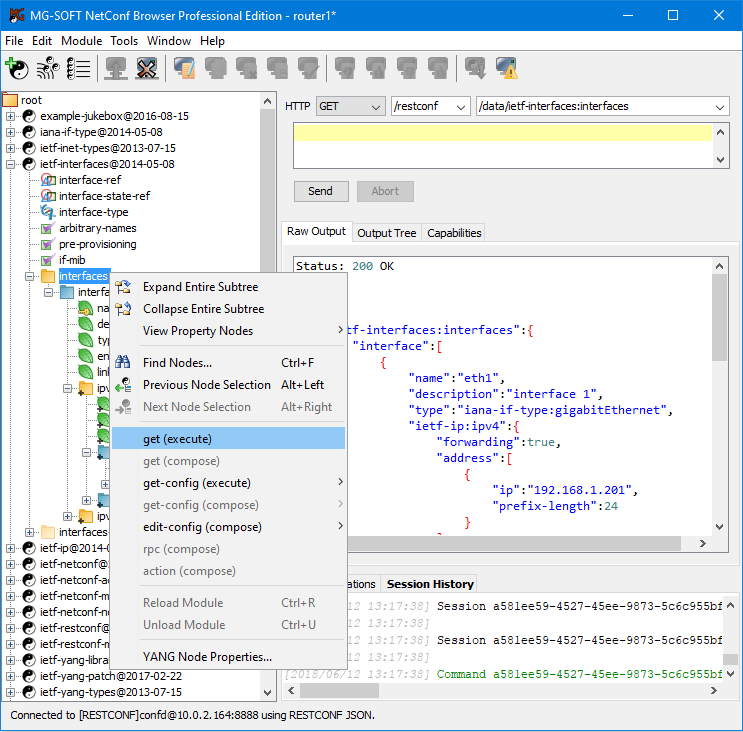 MG-SOFT NetConf Browser Professional Edition is a powerful and user-friendly NETCONF and RESTCONF client application that lets you retrieve, modify, install and delete the configuration of any NETCONF or RESTCONF server device in the network. The software can load any set of standard or vendor-specific YANG 1.1 (RFC 7950) and YANG 1 (RFC 6020) modules and display their contents in a visual manner, where module elements are represented in a hierarchical tree structure, containing nodes on which NETCONF or RESTCONF operations can be invoked. NetConf Browser offers an intuitive user interface that lets you easily retrieve the device configuration and state data as well as modify the device configuration via the NETCONF v1.1 (RFC 6241) or NETCONF v1.0 (RFC 4741) protocol operations (get, get-config, lock, unlock, edit-config, copy-config, delete-config, commit, etc.). The software supports establishing NETCONF sessions over SSHv2 (RFC 4742 and RFC 6242) and TLS v1.2 (RFC 5539 and RFC 7589) secure transport protocols. NetConf Browser also supports NETCONF Call Home (RFC 8071), where a NETCONF server is the peer that initiates a secure connection to NetConf Browser. The application has a built-in certificate manager tool lets you effortlessly generate and manage X.509 digital certificates used for NETCONF and RESTCONF communication with public key authentication. MG-SOFT NetConf Browser now fully supports also the RESTCONF protocol with both, XML and JSON encoding of data (RFC 8040). NetConf Browser lets you use all standard RESTCONF HTTP methods like GET (screen shot) , POST, PUT, PATCH, DELETE etc., invoke proprietary operations and actions, and allows receiving server-sent event notifications via RESTCONF protocol. The software incorporates YANG-based auto-complete mechanism for composing the RESTCONF URIs, as well as fully fledged auto-completion feature when writing RESTCONF message payloads in XML and JSON format. NetConf Browser supports regular, client-initiated RESTCONF sessions, as well as RESTCONF Call Home sessions. In addition to providing a quick access to common NETCONF and RESTCONF operations, NetConf Browser also implements advanced tools, like the RFC 6110-based NETCONF Content Editor and Validator that has been extended by MG-SOFT to support also YANG 1.1 and RESTCONF protocol and allows you to easily compose any type of NETCONF XML or RESTCONF XML or JSON document and validate it using the DSDL schemas, which are automatically generated from selected YANG modules. 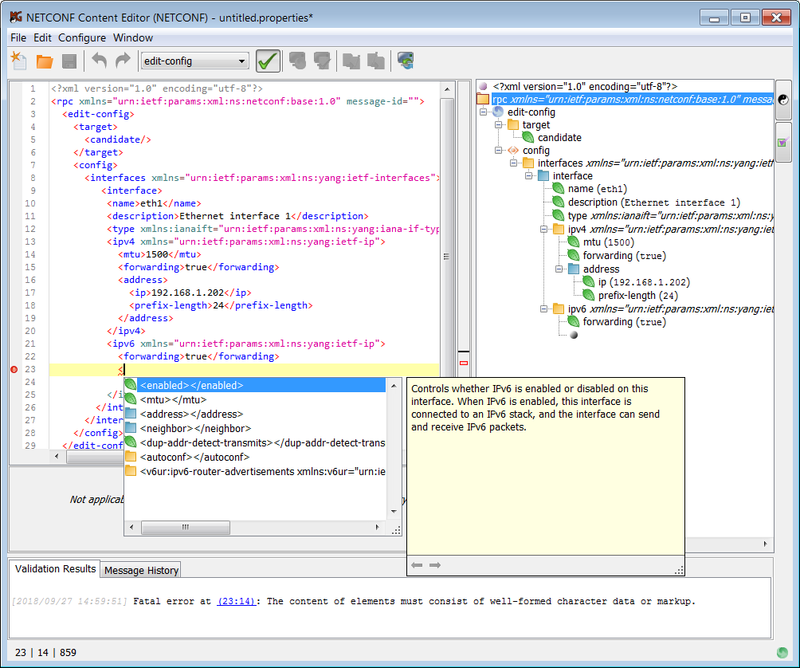 You can edit a NETCONF or RESTCONF document or message either by using the full-fledged XML/JSON editor with syntax coloring and auto-complete feature (screen shot) or by using the Visual editor. The latter lets you simply right-click a node in the tree view and add/remove elements and set their values by choosing commands from the context menu (screen shot). 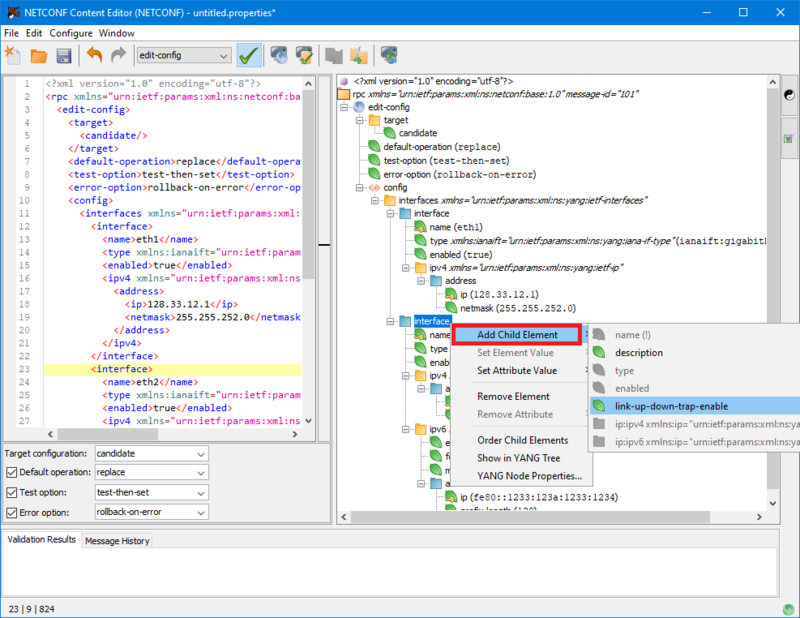 Both editors guide you while composing the NETCONF or RESTCONF content by allowing you to add only those constructs that are valid at the given location in the document. Furthermore, easy-to-understand validation messages let you quickly fix all syntax and semantic inconsistencies before sending a valid XML or JSON document to the server, e.g., to modify a configuration or perform any other NETCONF/RESTCONF operation. In addition, the software lets you generate a configuration from YANG data model and apply it on the server. It allows you to select, e.g., a subtree node and generate a NETCONF XML instance document or RESTCONF XML or JSON document to be sent as payload of a configuration modification request (also generated). The generated configuration will contain all "config true" data nodes from the given subtree with valid, yet dummy values that can be easily edited before sending the content to a server. This powerful feature allows you to quickly create a configuration from scratch. Furthermore, NetConf Browser supports subscribing to and receiving event notifications (RFC 5277) via the NETCONF and RESTCONF protocol. NetConf Browser also supports the YANG Module Library mechanism (RFC 7895) and the NETCONF get-schema operation (RFC 6022) that enable downloading schema definitions (e.g., YANG and YIN modules) from remote NETCONF servers either automatically or manually. The software lets you save all device-related parameters, like the device address, NETCONF/RESTCONF connection details, supported data model (YANG modules), etc. to a device profile, so one can later quickly start managing a specific NETCONF or RESTCONF device by switching to the relevant device profile. MG-SOFT NETCONF Browser is compliant with the following IETF's RFC documents: RFC 4741, RFC 4742, RFC 5277, RFC 5539, RFC 6020, RFC 6022, RFC 6110, RFC 6241, RFC 6242, RFC 6243, RFC 6991, RFC 7589, RFC 7895, RFC 7950, RFC 7951, RFC 7952, RFC 8040 and RFC 8071. MG-SOFT NETCONF Browser is a Java(TM) application that can be installed and used on Windows, Linux and Mac OS X operating systems with Java Runtime Environment version 7.0 (a.k.a. JRE 1.7) or later. "Thank you MG Soft for helping me with a dodgy vendor YANG file. Lost in a sea of errors and frustration, you came right out and told me where the issue was. The NETCONF Browser is a god send and your support is second to none. Big thanks from a very happy customer."